Morning from my own home! My mother-in-law is doing great and she kicked me to the curb! She's ready to get back to her normal life and I'm happy to be home with Bret. I've missed my sewing, even when I'm not sewing, I like sitting in my sewing room and looking at my stuff. I'm sure she missed doing stuff without me checking on her every 5 minutes! It was a fun time though, and I'll miss it! I've been thinking a lot about my stash of fabric. Not just my pkm stash but all the fabrics I have and still love. I am considering a small project and made a quick fabric pull. Not sure if any or all of these will show up in my project or really, even if I'll actually make it but it was fun. I really enjoy quilts made with fabric that is pulled from many different lines. I'm working on a quilt from an old 2002 For the Love of Quilting Magazine, named Wild Irish Rose. I originally made it in 30's fabric and always wished I had made the flower centers with connector triangles, so this time I cut some squares for that. I think these will turn out well, the little corners won't line up to the pieced squares, so no pressure there, we'll see if my grand plan works when I begin to stitch it all together. 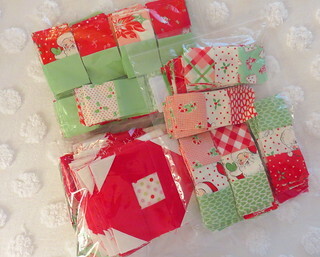 My fabric inspiration is Urban Chiks Swell Christmas. Kristyne made my quilt inspiration (see it here on Instagram) and you recognize my kit making style. This project is using strip sets so there's lots of units that I have ready to assemble. I have one more strip set to cut and that's ready for some power sewing. I'm glad I saved the magazine, I really like the way that the project was organized. Organization is key when you're working on a longer term project.. there's lots of things here that look similar but are used in different spots. 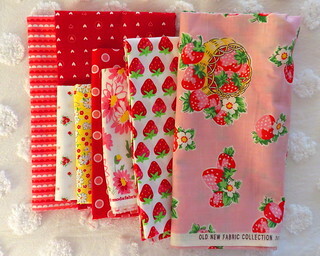 Mine are all in different little bags (saved from fabric orders!) and they correspond to each step. I hate it when I've set a project aside then have to do some quilt forensics to figure out what needs doing next. That's what doing with me. We've had some California fall weather in the 70s but this week it will soar back up to the 90s in what hopefully with be the end of the summer heat. HOPEFULLY. Loving your fabric choices! You mentioned your kit making style...do you have previous blog posts about what you do?